The Alzheimer’s Disease Cooperative Study (ADCS) at the University of California, San Diego, provides newly-made quilts to participants enrolled in our clinical trials taking place throughout the United States. The quilts are crafted and donated by quilters throughout the country. Quilts are inherently a form of nurturing and self expression and are a symbol of hope. Quilts are also a way for people to express their empathy and support of patients and their families affected by Alzheimer’s Disease. 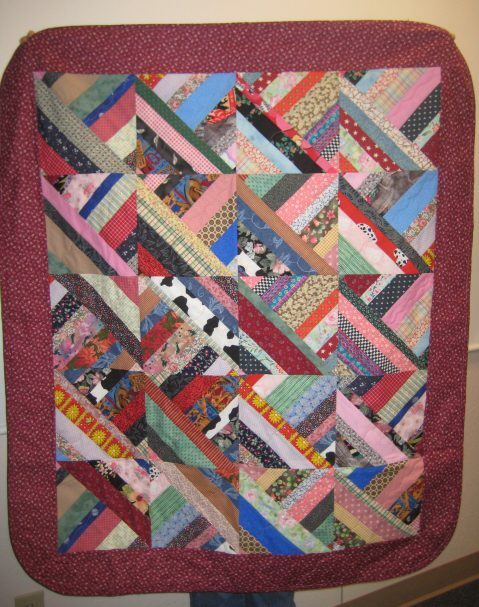 Many quilters who donate their works often include letters detailing memories and stories of loved ones who have been affected by Alzheimer’s Disease and why they have chosen to donate a quilt to the project. The ADCS provides these hand-made quilts to study participants as a form of gratitude and hope for their participation in our clinical trials. We accept quilts on a continuing basis and distribute them to our research study sites located throughout the U.S. Your donated quilt should be lap-sized and approximately 45-50 inches wide and 50 to 55 inches long, and made of 100% cotton or flannel. The study participants are both men and women therefore a variety of colors work best. We thank you for your donation and will email you an acknowledgement once received.